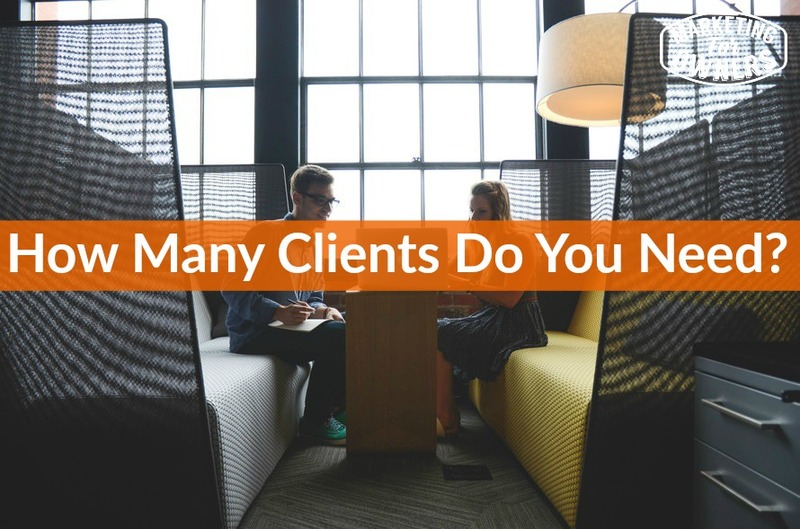 So in your business, I want you to think about the number of clients that you actually need. See it’s not just about customers, about sales, you need a number of clients. Now if you are say Amazon or even Fire Protection Online, my e-commerce store, we have a lot of one off orders and we get many many orders every single day. And so it’s not quite the same, more of a customer base. A client I am going to describe a client as someone who comes back, like a repeat customer or a regular customer, who is more of a client. So if you are a therapist, you might have someone who comes but every month or every week for treatment. They are more of a client, whereas if you have a one off visitor, more of a customer. Does that make sense? It kind of makes sense to me. But, let me give you an example of this because if you are thinking to yourself oh, I want to make £10,000 a month, $10,000 a month, whatever it is, then it’s better to think of it, break down the numbers and make it easier to attain that level. So let’s go for the therapist, say you are, and I don’t know, but say you look after people’s backs, people have bad backs. People come to you say every couple of months, you work part-time, people who need certain things, you work part-time, this is not a full-time thing, you haven’t got other people working for you. So let’s say you can look after six and obviously I am going to get this all wrong so I’m just making this up, but just to help you think the process through. So let’s say on an ideal day, you can have six clients because you’re taking the kids to school and you’re picking the kids up at the end of the day and you have got a certain window in between, you can handle six clients. In a month, there are roughly twenty working days, some months more, if we’re talking five days a week, no roughly twenty working days. Now if your average client comes back every other month for a treatment, then you don’t need to work out how many clients you need for twelve months, you only need to work out how many for the two months. So, six times twenty, six a day times twenty a day is one hundred and twenty; two months, two hundred and forty. Now of course there is going to be some leeway, there will be some one offs, there will be people who finish their treatment. So let’s just bump that up and say we need three hundred clients. So that is how you figure it out, you will hopefully have more detail on how you can work out, you know how often you are likely, the best type of clients come back and so you aim for three hundred clients. Now you will have a base of them and you might at the moment be full up, but at some point or other, clients will start to finish their programs and go off. You need to have a queue of customers, you need to have a waiting list, you need to have people knocking on your door. It is a good thing to tell people that I am really really sorry, we are actually booked up. Now however, we probably will have space in the next two weeks or in the next month, so if I can take a number and call you back, or if you would like to call me back, and by the way, it’s much better for you to take the number and call them back, because they will go off and forget. So don’t make it hard for the customer, remember? So don’t think to yourself “Well, I have got the number.” You always need to be looking for more. But if you can work out how many, then if you want to work out how much money you want to earn, now of course if you are trying for 10,000 a month, let’s say that part-time let’s say you are aiming for 3000, is this going to divide 3000 a month, you want one hundred and twenty clients per month, yeah. So you just divide it up and then you can work out how many hours you’re going to work and then how much you need to charge per hour and then cover your costs and so on and that kind of thing. Because don’t forget, you want to earn profit for stuff, profit that goes into your pocket. But, just consider the number of clients, if you have a six month cycle, if you are a dentist and you have a six month cycle or if you service fire extinguishers and you visit them once a year, if you service fire alarms and you visit them four times a year, you can work out how many clients you need. Then you can work out what it takes to get a client and then do more of that instead of aiming for money. Because one person may spend this, another may spend that, so aim for the number of clients and that’s why. It works. It is, reverse engineer everything like that, think of stuff logically that makes it much easier than just chasing cash totals, honestly. Tuesday I was going on a rant about Internet marketing not being very nice and so on. One thing I do want to point out is that whereas I am not an Internet marketer. I wasn’t sort of preparing you for any big sale event. However, I have some new goodies coming and if you want to know all about it, because these will cost money, they won’t cost much and I can guarantee that if you ever buy something from me, it, first of all, it is only designed to do a job for you in your business. But if you ever buy anything from me, I can personally tell you that if you ever at any point think it wasn’t quite what you thought, it wasn’t worth the money, you can ask and I will give you your entire money back, okay? I will give you your money back and that is that. But I will never ever promise you anything about making any money. I will improve your business and do other things, but I’m not going to tell you I’m going to make a load of money because you my friend still have to do the work. And by the way, if you want to find out about these, the best bet, because as you know I don’t really go on about the commercial side of things, the best bet is to go to my site at marketingforowners.com and join the Owners Club. Now one of the special things that’s coming is the gold level of the Owners Club and I am not going to tell you about it because it’s going to be a lot of off-line stuff we actually meet up for real, things like that. But you can join the Owners Club and it’s no cost to it, it’s at the top of the page, you just need to say you are not logged in, learn more, follow that. Or, if you go to marketingforowners.com/71, that is an incredibly popular book and a guide it’s got loads of tools and it’s just been updated. So go grab that and then you will be on a list, yes you will be on a list, this is how this stuff works. You can unsubscribe anytime, you don’t have to, don’t you worry. But you’ll be on that list and when we have got anything you will get the first announcement and I might add, if you are a member of the Owners Club the free level, when it comes to gold, you are the ones that will get the awful. Yes, there’s always an offer. Remember I talked about that before? You must have been listening. Today, Thursday, time for a drive time podcast. On your way to work, on your way home, while you’re doing the shopping, while you’re doing the laundry while you’re hanging the laundry out on the line, while you are relaxing outside, while you are doing your grocery shopping. I listen to podcasts when I am walking around in the grocery store, but today we are going to recommend an Australian. 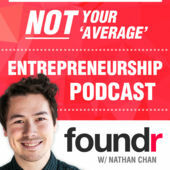 It’s Nathan Chan and the Foundr magazine podcast. The website I think is foundrmag.com. It’s great, he interviews, he actually gets fabulous guests, I mean really really top guests. I have a feeling he has even had Richard Branson on it at some point but he has certainly had him in the magazine. But for somehow Nathan is a go-getter, whatever he does he does to the nth degree and he makes it all sound very very possible. But he interviews good guests and he asks them slightly different questions like I do with mine. His are even better than mine, sometimes. But go listen, you will find it’s very popular, lot of ratings, see what you think and then give him a rating because that’s what we love. The same for the Marketing For Owners podcast, if you like this, go on iTunes and just give it a rating. You don’t have to clicka thing, you don’t have to write much, I would love to hear what you think. I’ll be back tomorrow with the weekend challenge.